Test Pit 9. Beech Cottage, Low Street. Beech Cottage is the central property in what was originally one 16th century dwelling fronting onto Low Street green, the others being Aldersyde to the south and Courthouse Cottage to the north. The cottages are Grade II listed buildings (NHLE No. 1352374). The Tithe map shows the majority of the current gardens of the three properties as a single piece of land (named in the apportionment as 'Gardens' and owned by Miss Doughty) in separate ownership to the cottages. The cottage gardens are partly enclosed by a flint and brick boundary wall which also marks the eastern boundary of the Hoxne Hall/Oakley Park estate. The Test Pit was located at the rear of the garden, c.2m from the boundary wall, in an area of scrub ground amongst a series of sheds etc. 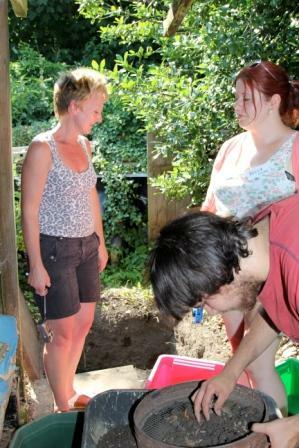 The pit showed a uniform garden topsoil deposit, Context 1, extending to a depth of at least 0.7m. Sherds of GRE (16th-18th century) and some Frechen stoneware from the Rhineland are the earliest of the pottery from this pit. Other ceramics date to the Victorian period or later. A fragment of decorated clay pipe stem was present, and the remains of a pipe bowl. The thick topsoil and mixed finds material corresponds to the lengthy known use of the plot, as gardens to the rear of the cottages fronting Low Street, since the 16th century. However the test pit did not extend through the base of the topsoil deposits and it is possible that buried soil horizons or features relating to the medieval settlement could be preserved at depth.